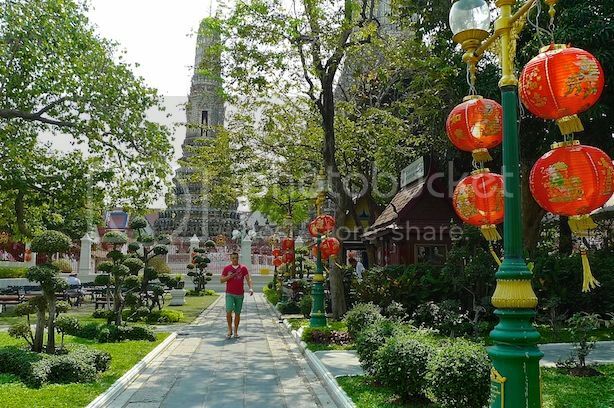 On my 3rd day in Bangkok, I visited the famous Wat Arun temple with my Filipino blogger friend, Ishmael Ahab. 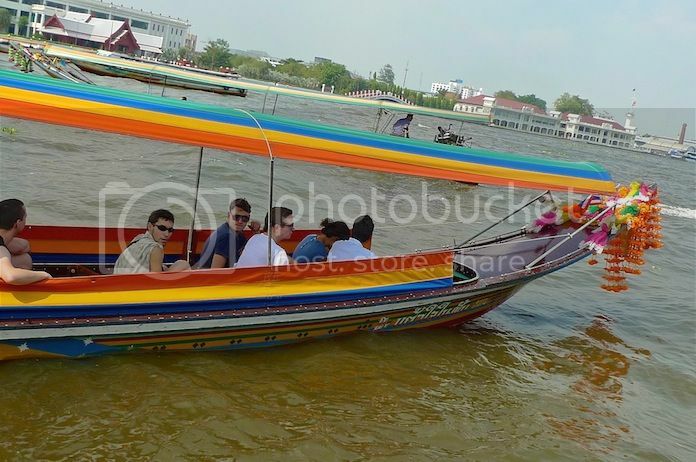 After our delicious breakfast of roasted duck at Prachak Pet Yang and yummy sticky rice with durian dessert at Boonsap Thai Desserts, we walked to the nearby Sathorn Pier to take a boat ride to Wat Arun. Along the way, we passed by Shangri-La Hotel. Look at those red cabs lining up outside the hotel! 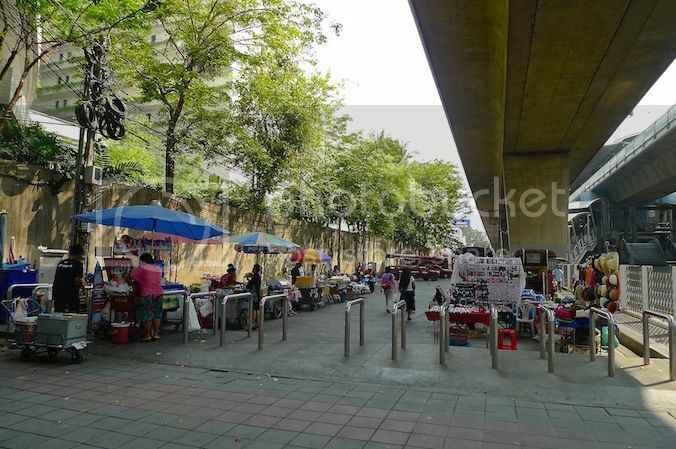 The hotel is just next to the Saphan Taksin BTS Station. 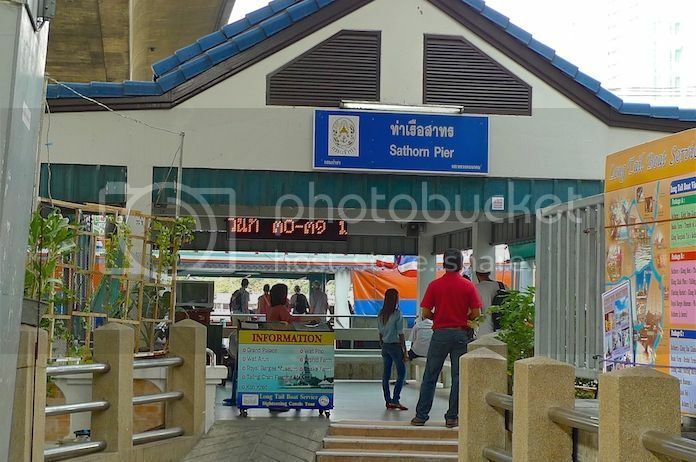 And the Sathorn Pier is just behind the BTS Station. 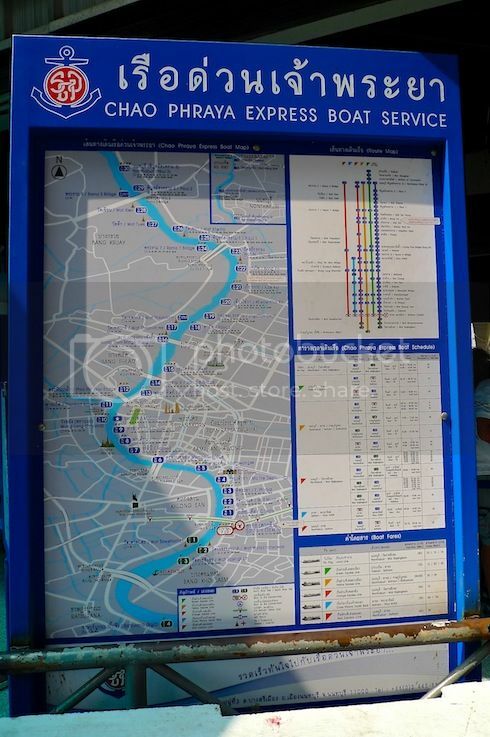 So if you plan to take a boat ride along Chao Phraya River to tourist landmarks like Wat Arun, Chinatown, or Grand Palace, all you need to do is to alight at the Saphan Taksin BTS station and walk a short distance to the Sathorn Pier. 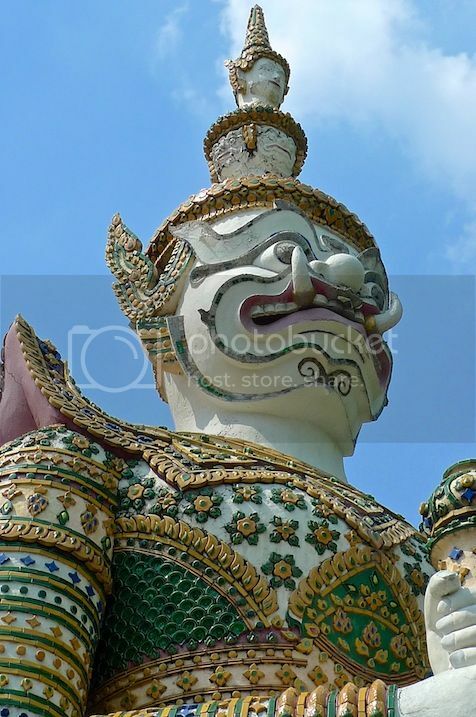 This is the first thing you see at Sathorn Pier. 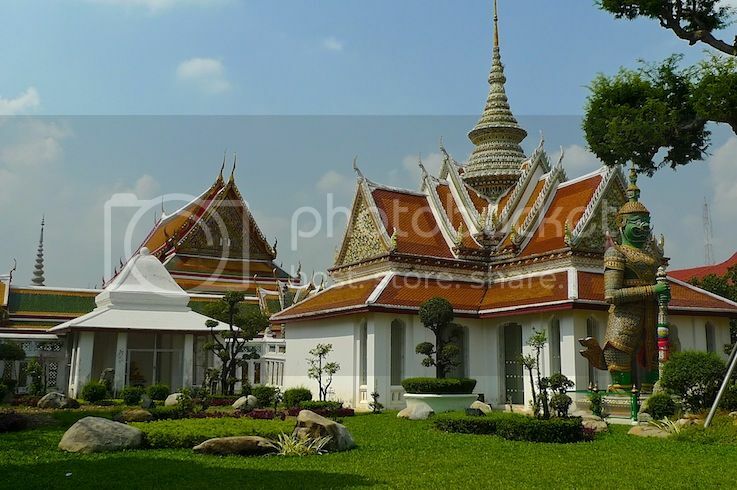 It is more for the Shangri-la Hotel's guests or anyone seeking information on tourist attractions in Bangkok. For everyone else, turn left instead. 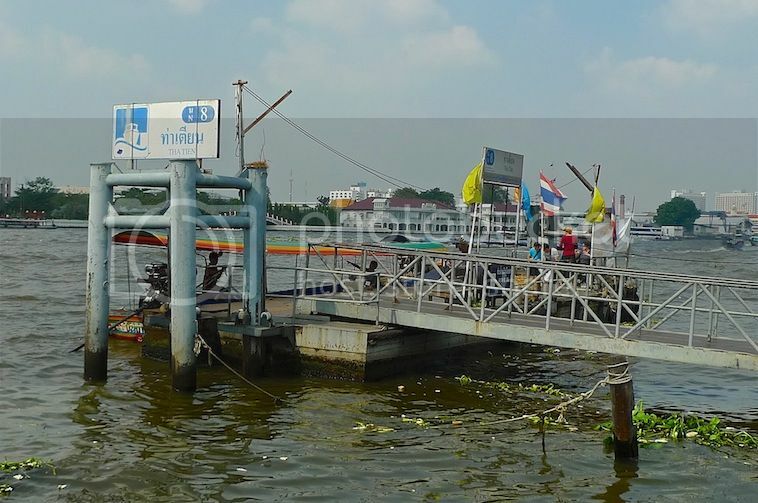 There was a signboard with detailed information on the various boat rides. 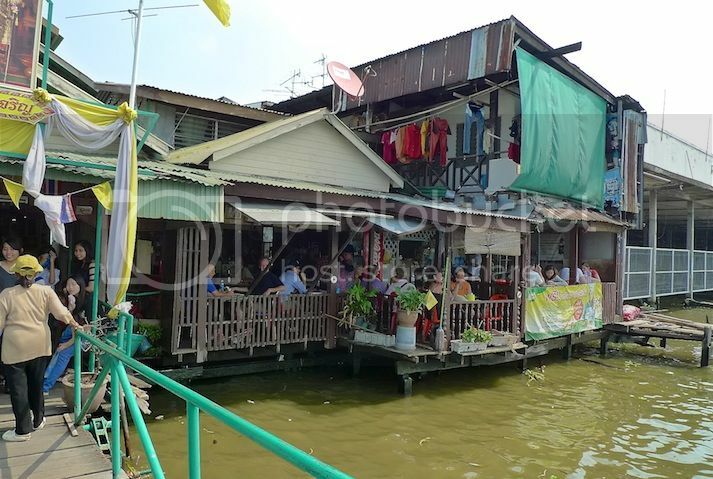 I have already blogged about my boat ride on the Chao Phraya River before, so I will not be blogging about it this time. 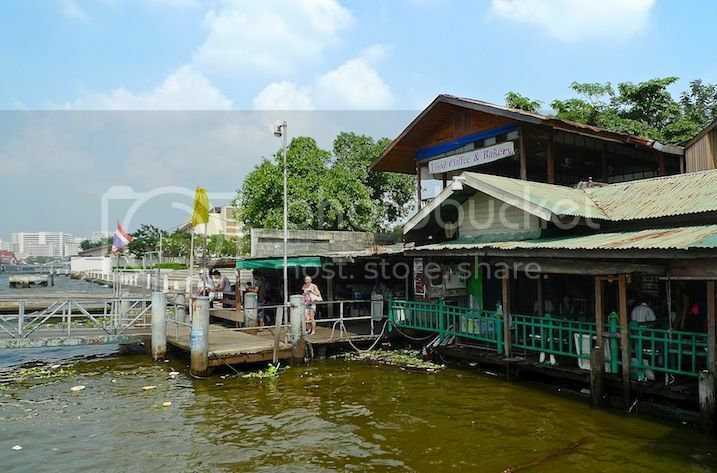 If you like to read about my boat ride to Wat Pho back in 2012, or you want a simple guide to the boat services at Sathorn Pier, read HERE. 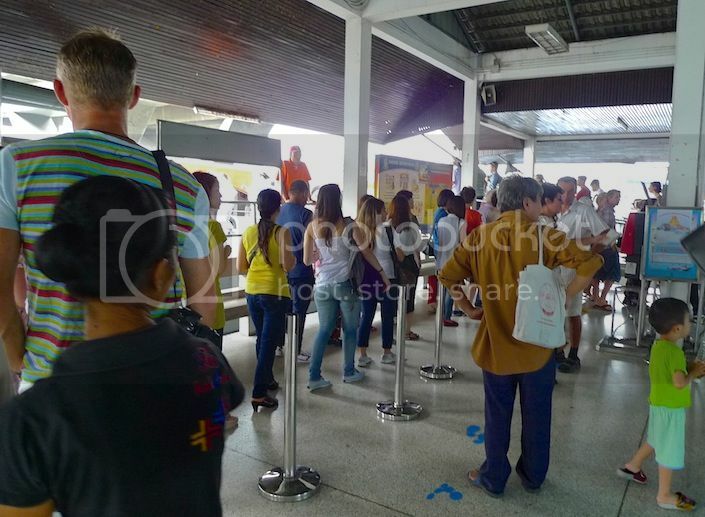 As usual, there was quite a long queue waiting for the boats. But we did not need to wait very long. Soon, we were on board the boat. 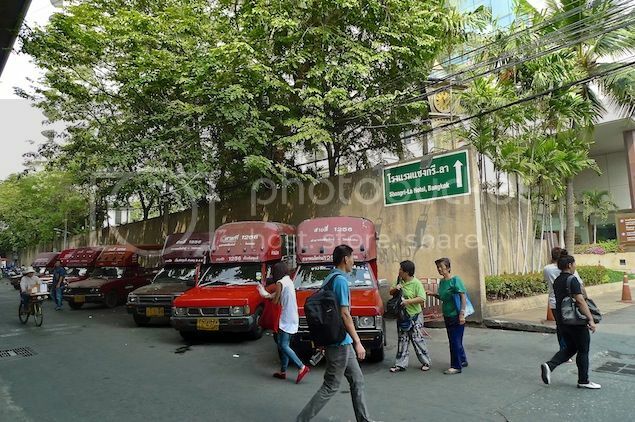 The fare was a flat 15 baht (USD0.50) - definitely the cheapest mode of transport in Bangkok! 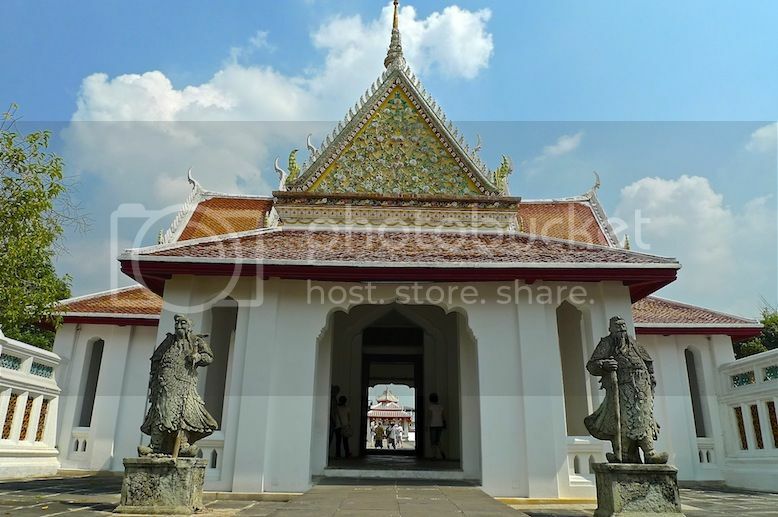 To get to Wat Arun, we needed to alight at N8 or Tha Tien Pier. 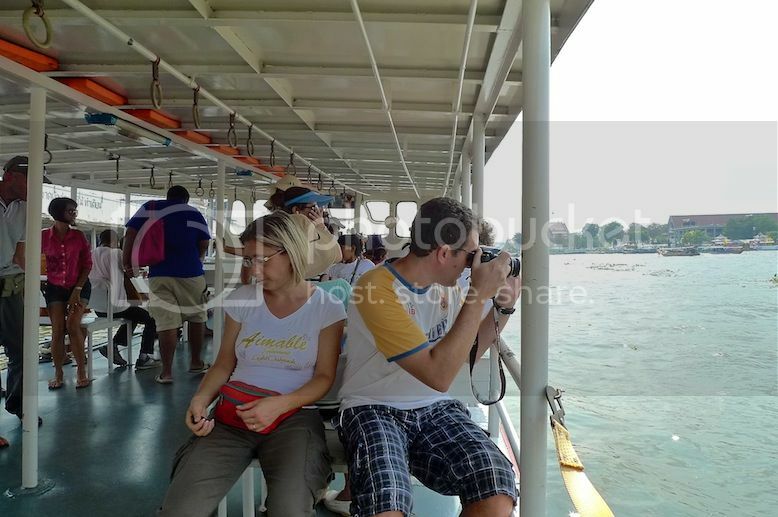 If you are a first timer taking the boat ride, you may accidentally miss your destination, so listen to the lady conductor (who collects the fare) as she will shout out the name of the pier and also the name of the tourist attractions (eg. 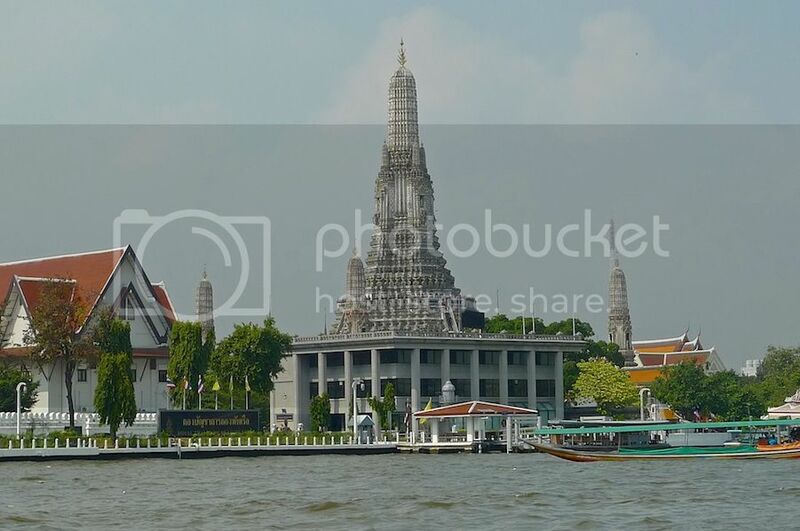 Wat Arun) as the boat approaches the pier. 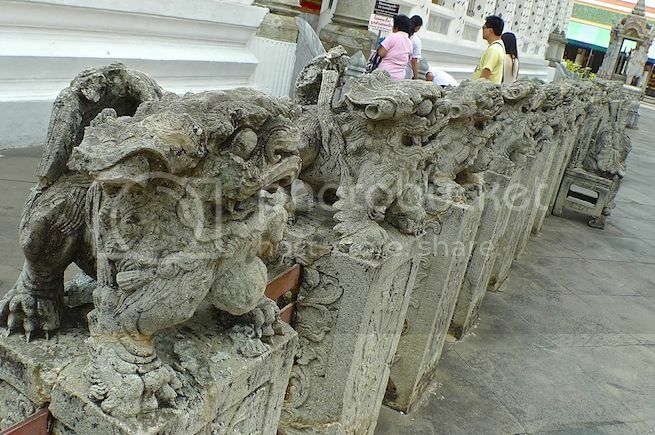 Or if you see this famous landmark of Wat Arun, then you know you have reached the Tha Tien Pier. 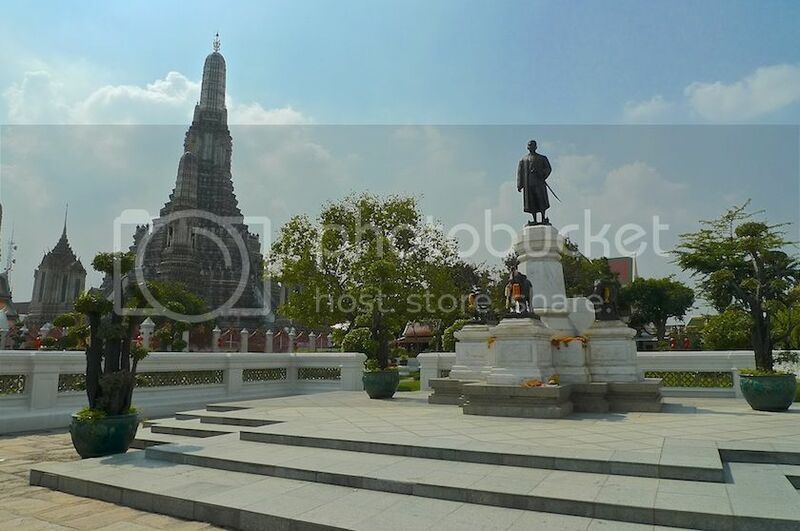 Wat Arun is directly opposite the Tha Tien Pier right across the river. 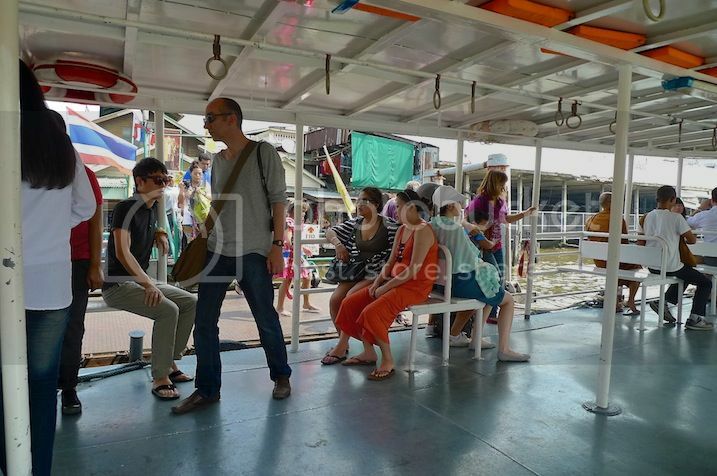 Once you alighted, you need to buy a ticket for the boat ride to go across the river to Wat Arun. The ticket costs 3 baht. While queuing up for the boat, I took some photos of the jetty. There are restaurants at the jetty for those who are hungry. Also some souvenir shops although we did not bother to check them out. It was just a short ride across the river to the other side. Could not help admiring those colorful paraphernalia hanging at the front end of this boat passing us. 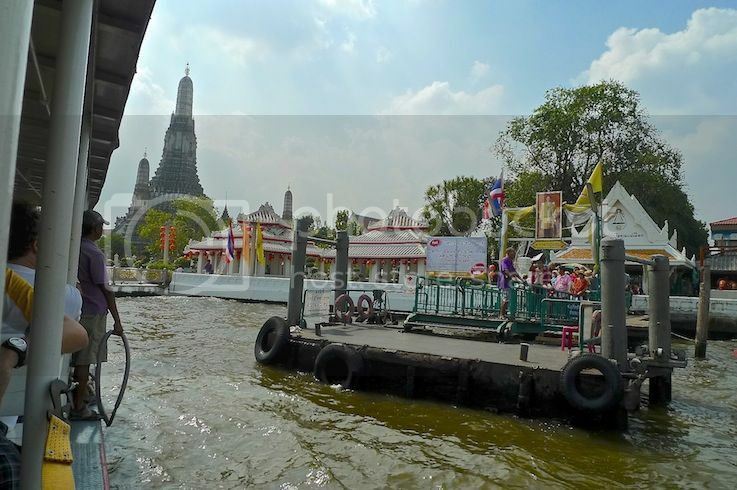 Docking at the jetty in front of Wat Arun temple. 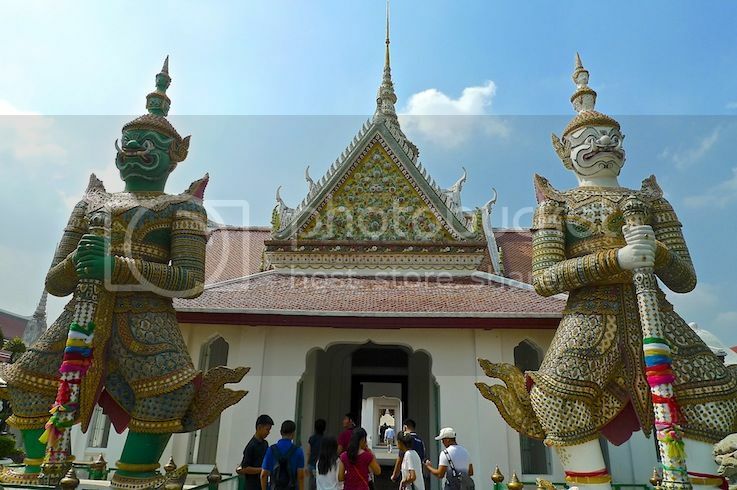 The grand front entrance to Wat Arun, with two huge guardians greeting us. Before entering, Ishmael and I walked around the outside garden area. 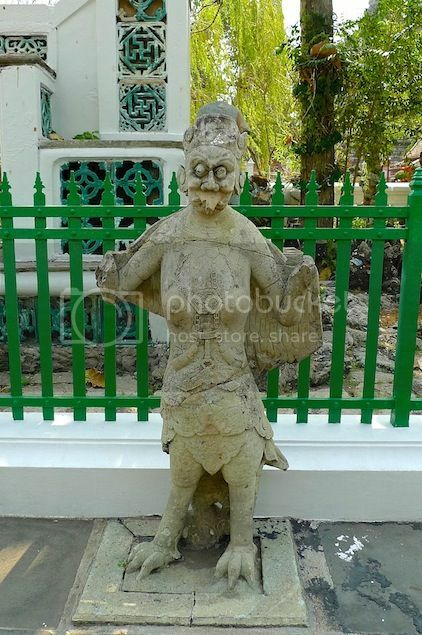 I thought this statue below looks like a vampire! This one too! 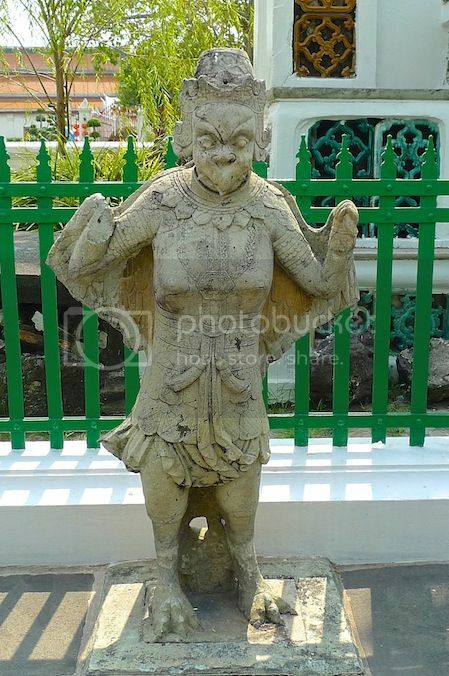 They were probably garudas - mythical bird-like creatures that appear in Hindu and Buddhist mythology. 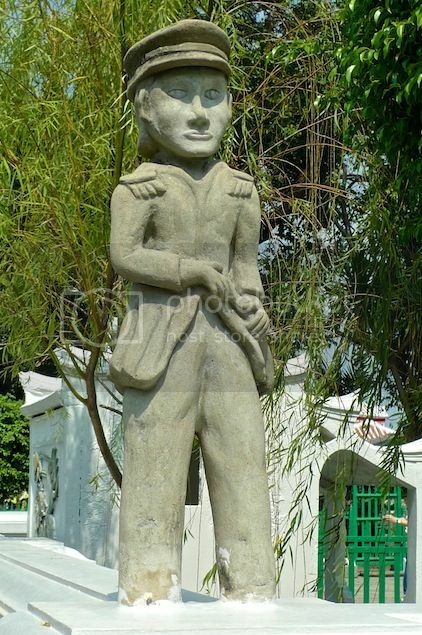 A statue of a soldier standing on a pillar. 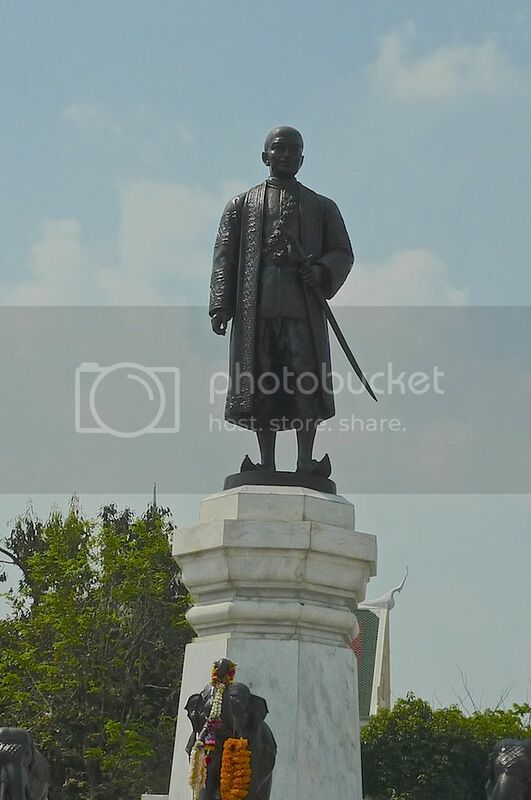 Another soldier standing on the pillar at the corner. 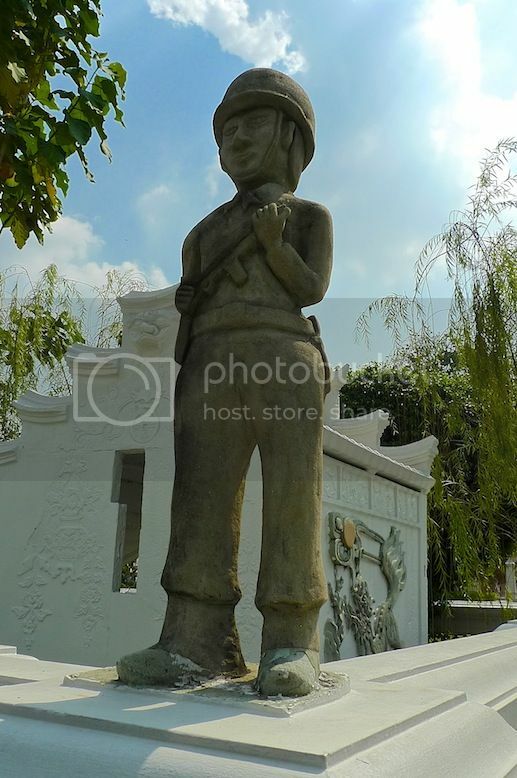 A closer shot of the soldier statue. 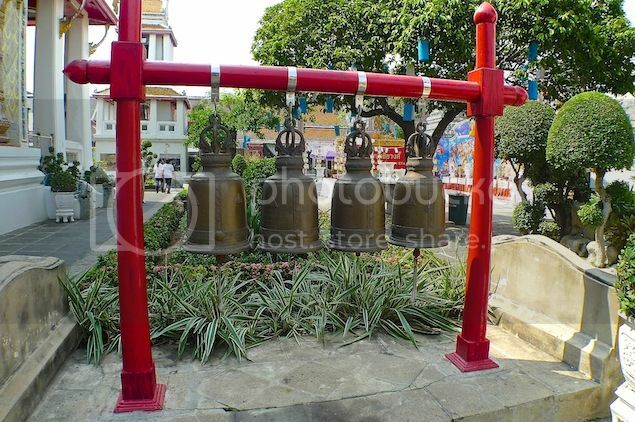 Red lanterns adorned the lamp posts around the garden. 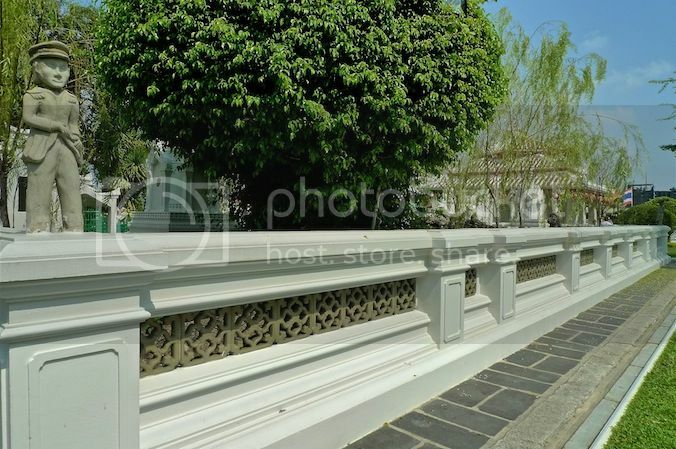 Near the banks of Chao Phraya River is the monument of King Rama II, who was responsible in the restoration of Wat Arun. 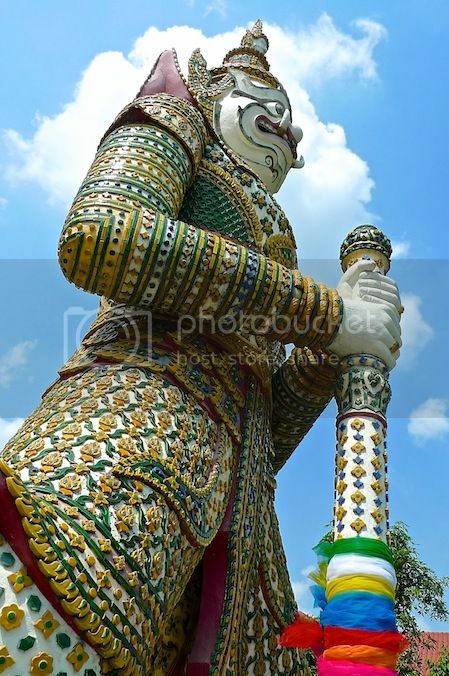 A close shot of King Rama II statue. Having visited the garden and the monument, it's time to enter the temple proper. 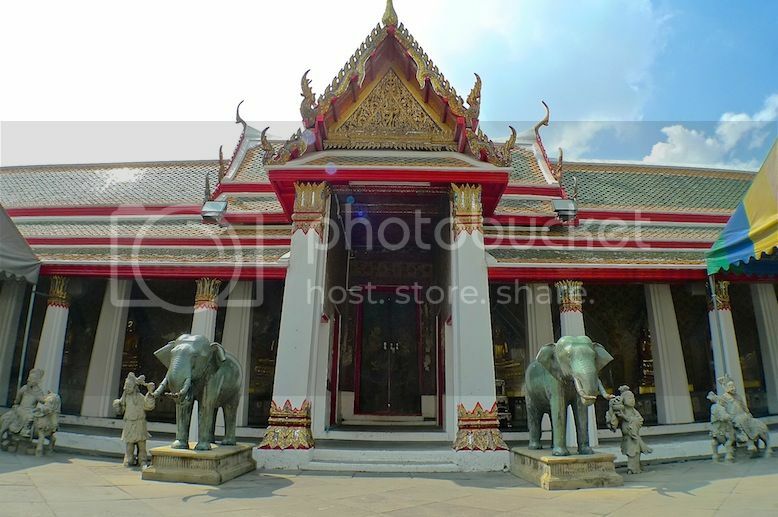 Everyone who enters via the main entrance will pass by two huge yakshas or demonic guardians. The white guardian on the right is known as Sahassa Deja. 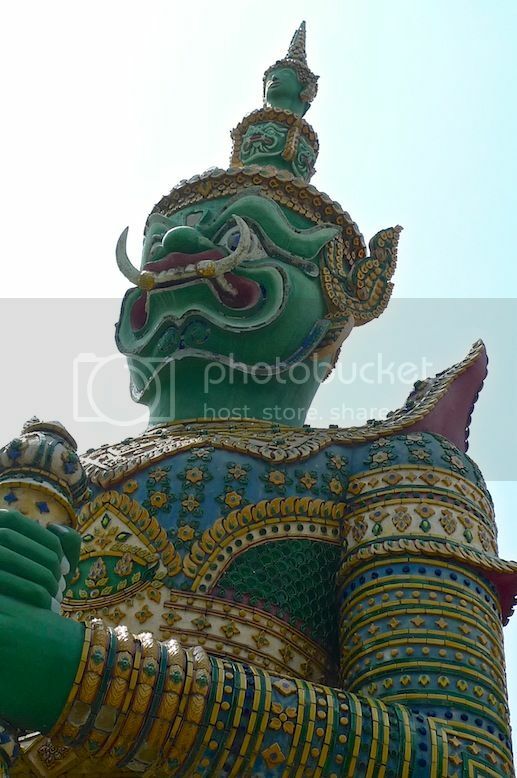 The green guardian on the left is known as Thotsakan. 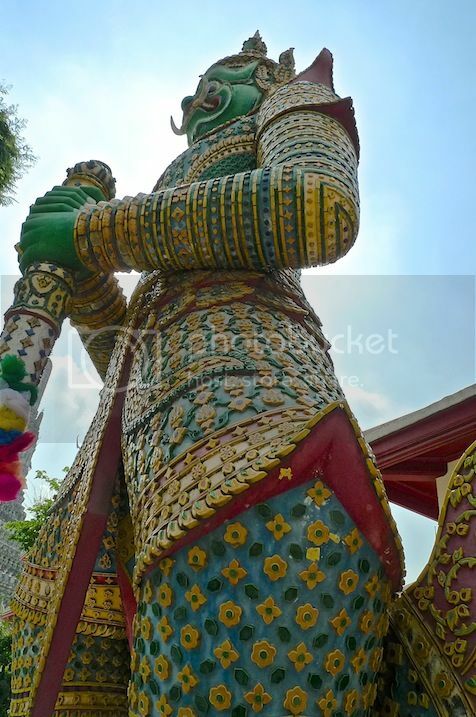 These two guardians are the villains in the Ramakien drama, the Thai version of the Hindu Ramayana epic. 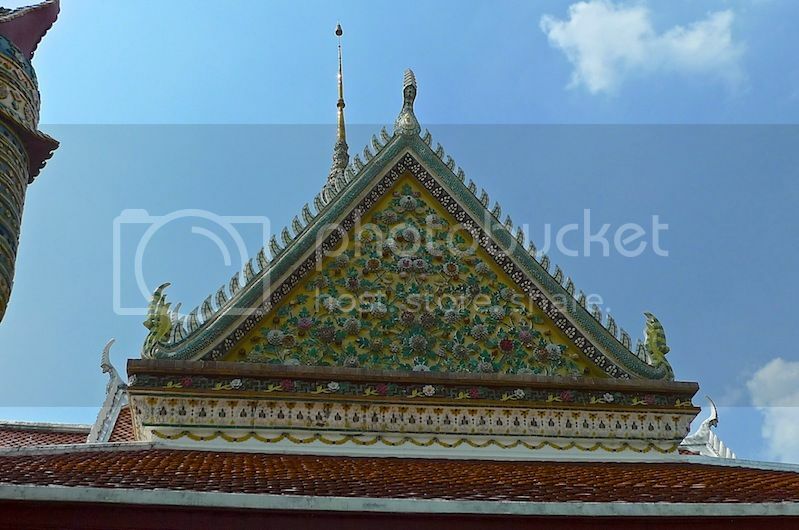 The roof of the main entrance was beautiful with intricate carvings. 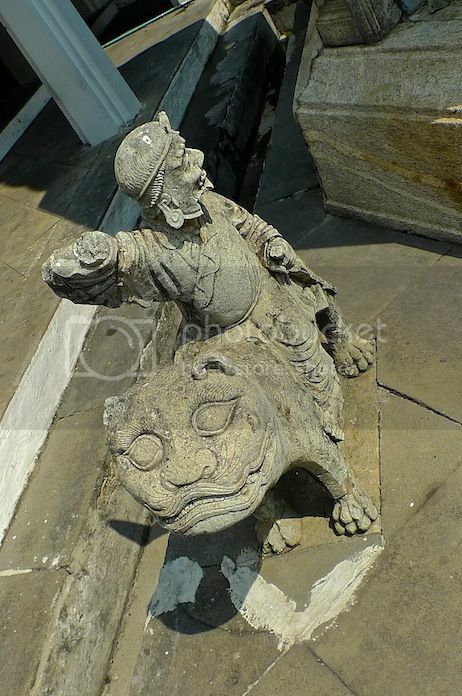 There was a row of Chinese lions outside the entrance. 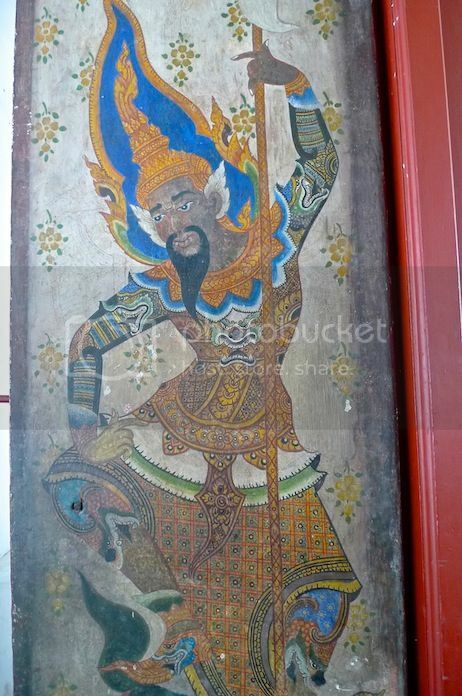 As we stepped into the main entrance structure, I saw some beautiful murals painted on the door like this one below. 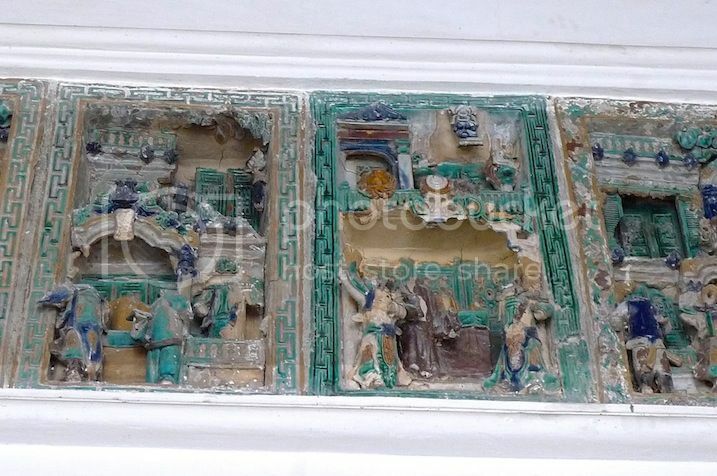 Some old carvings on the wall. On the other side of the main entrance, in the courtyard. 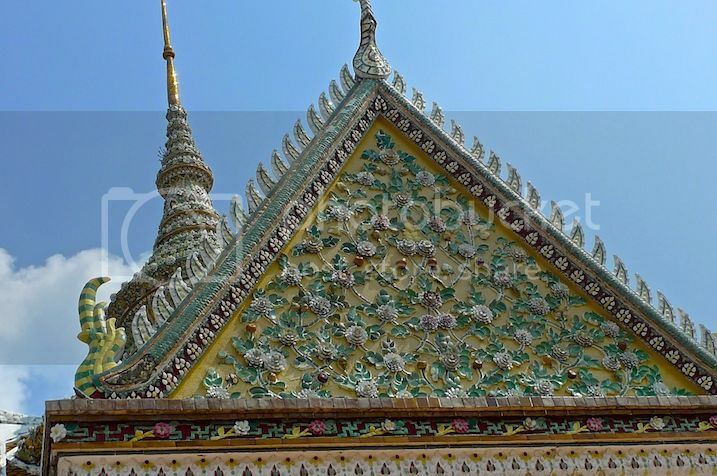 Took another shot of the roof with intricate carvings of lotus flowers. Beautiful! 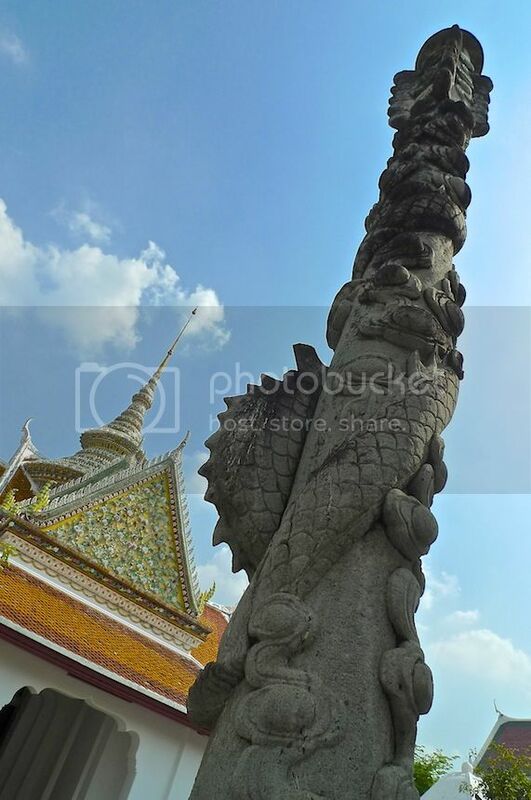 A tall totem pole-like structure inside the courtyard. 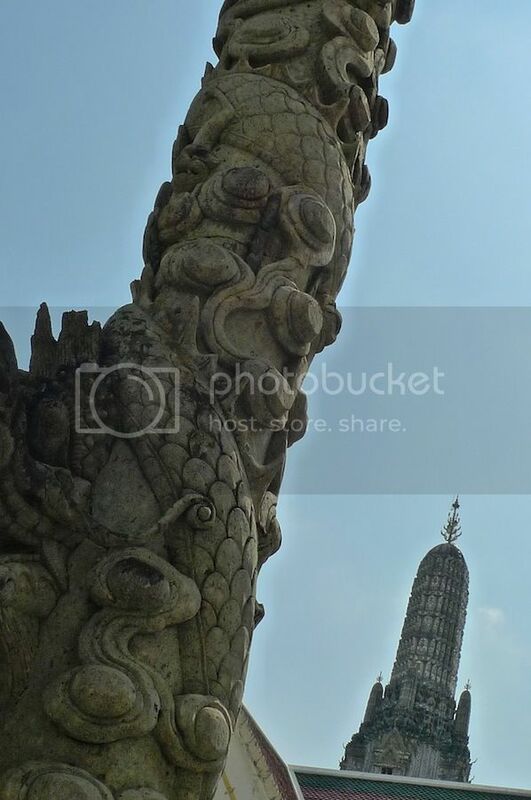 Look closely and you will see a dragon circling the pole all the way to the top. This courtyard was serene and quiet. The noise from the river could no longer be heard here. We then entered an inner courtyard. 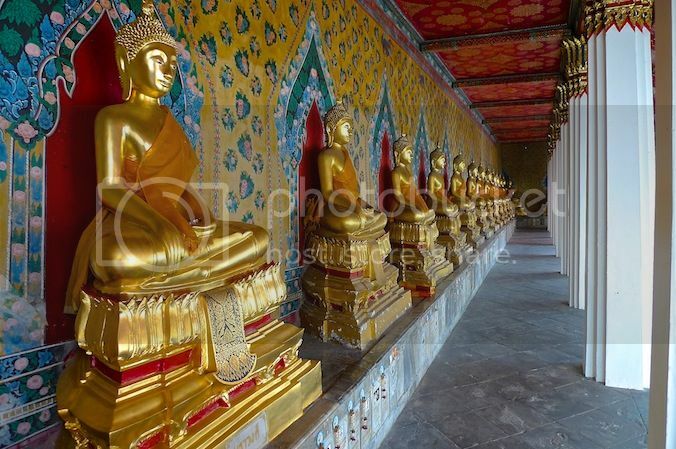 I saw a long row of Buddha statues here. 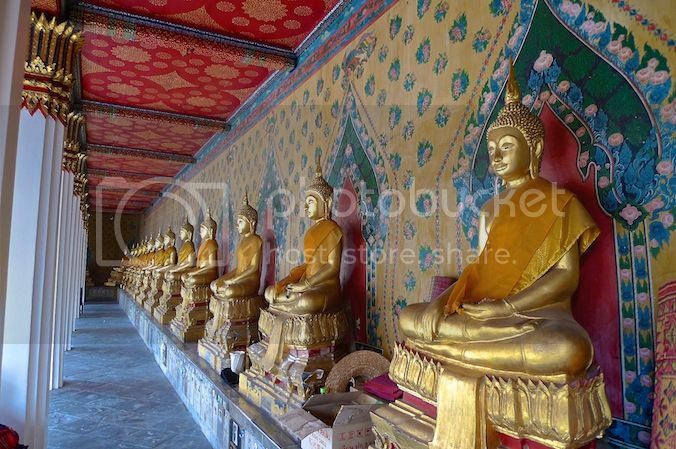 They were lining the walls of the Ubosot or the Ordination Hall. 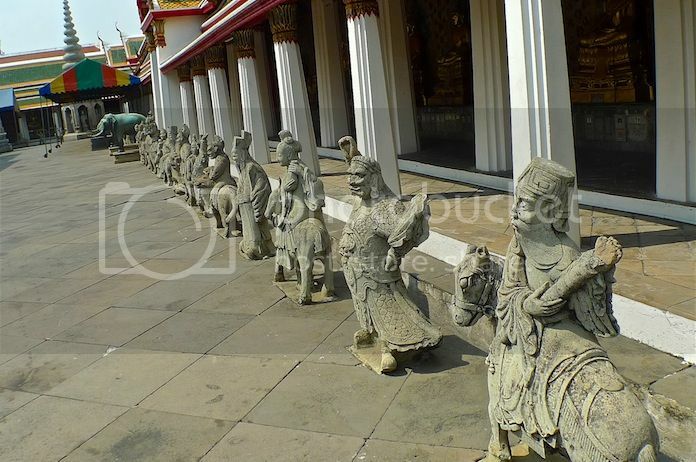 These statues were cast during the reign of King Rama II. Remains of the deceased are kept in the cubicles below the statues. 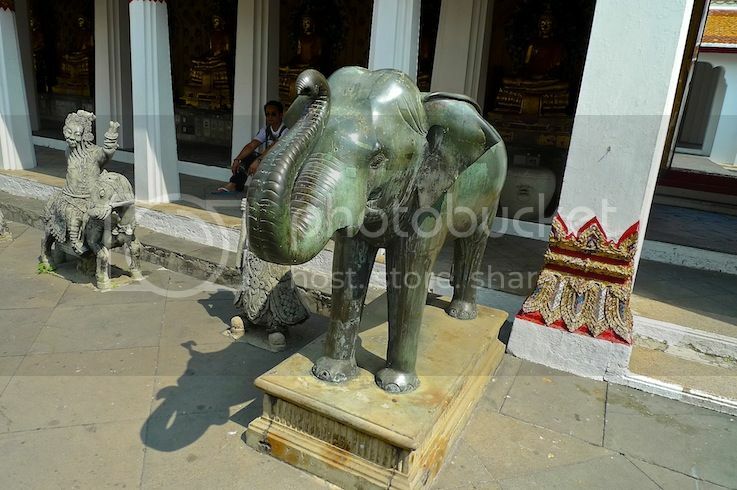 Saw an elephant in this courtyard. In fact, there were two of them. LOL! 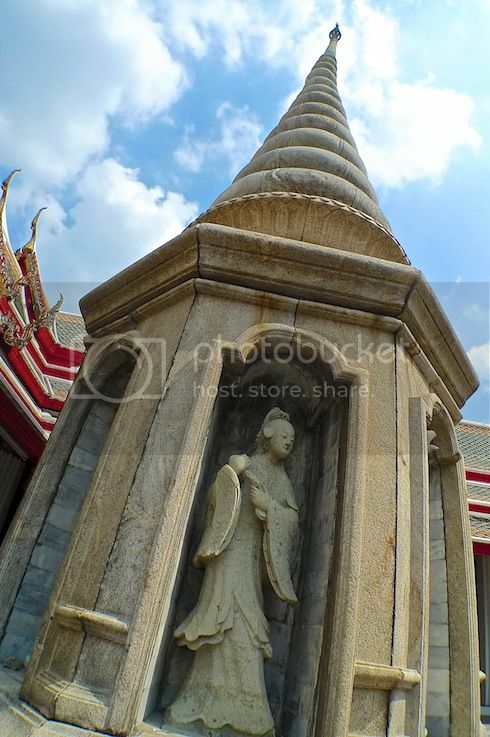 There was a stupa-like structure with statue of deities inside each compartment. 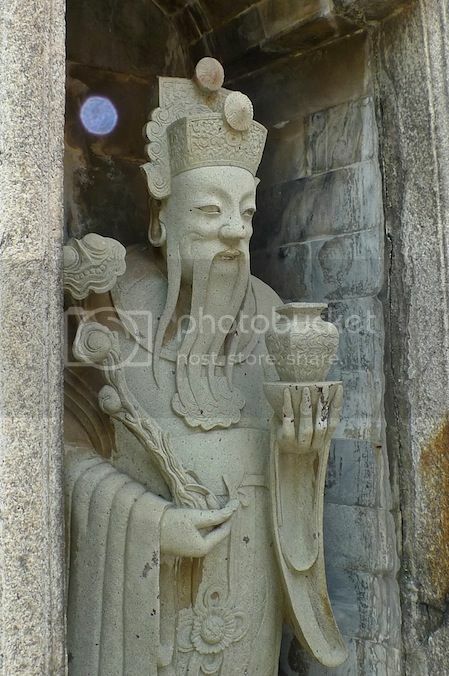 Close shot of some of the statues. 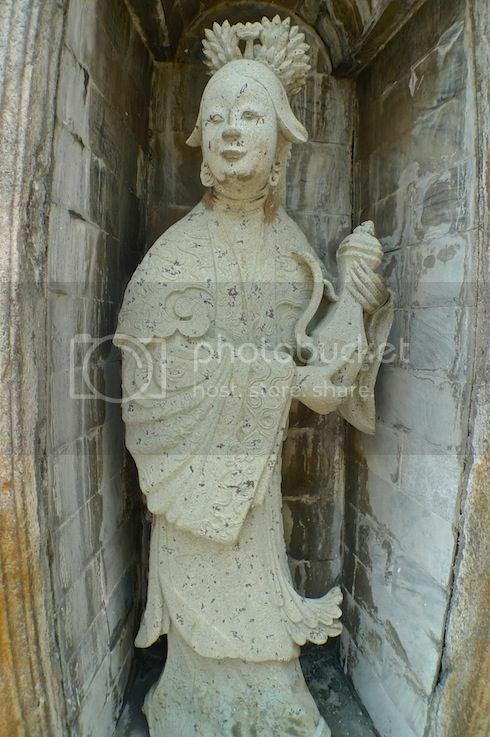 There were many more statues in this courtyard. 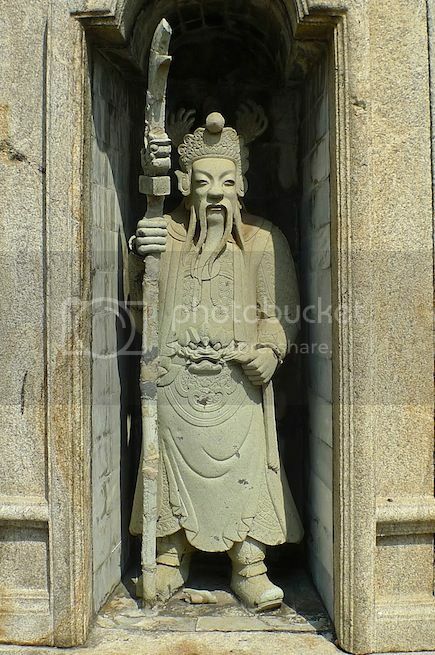 A row of statues lining the courtyard. 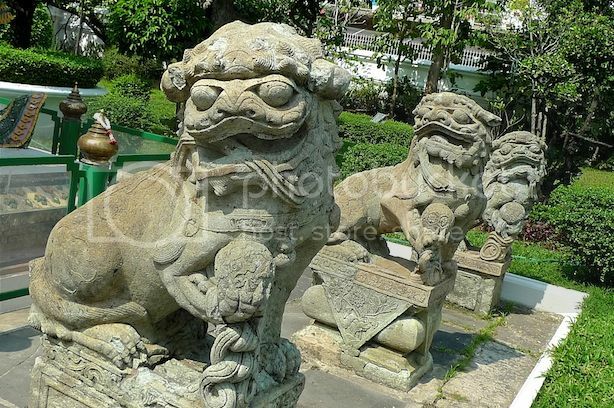 A row of lion statues lining outside the Ubosot. 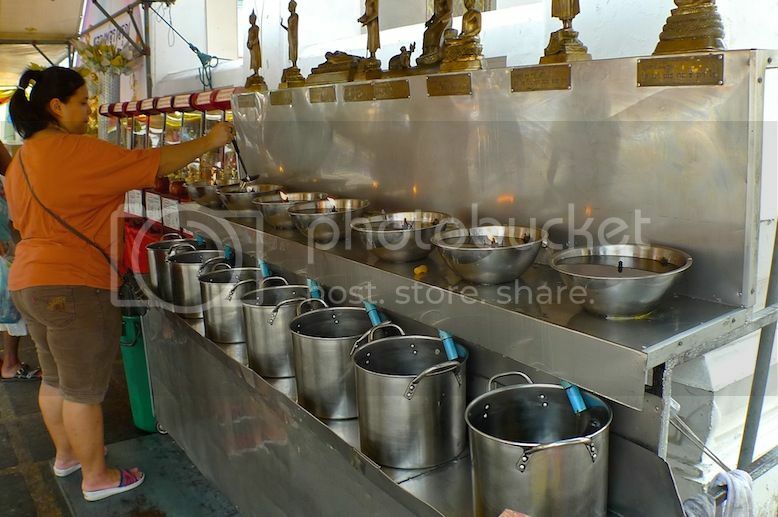 You are required to take off your shoes before entering the Ubosot. 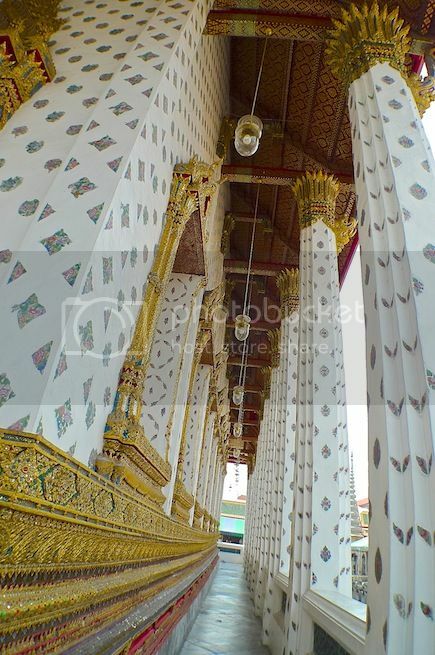 The outer porcelain walls of the Ubosot was beautifully decorated with gilded borders at the top and bottom. 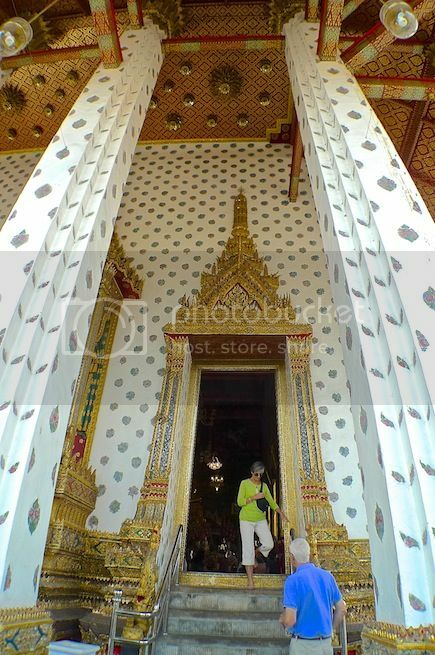 The door frames were beautifully decorated in 'gold'. 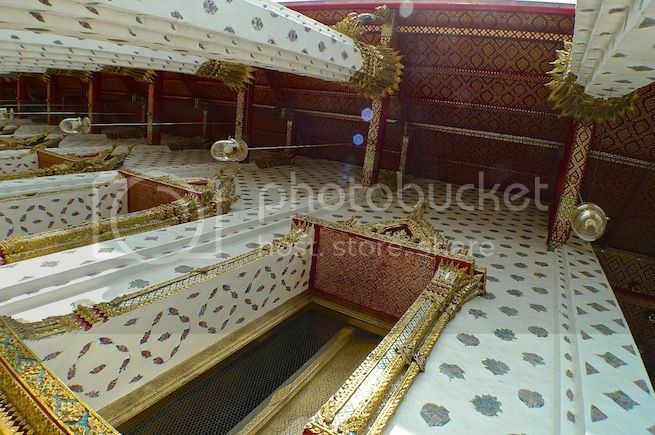 Even the ceiling was decorated in exquisite red and gold design! 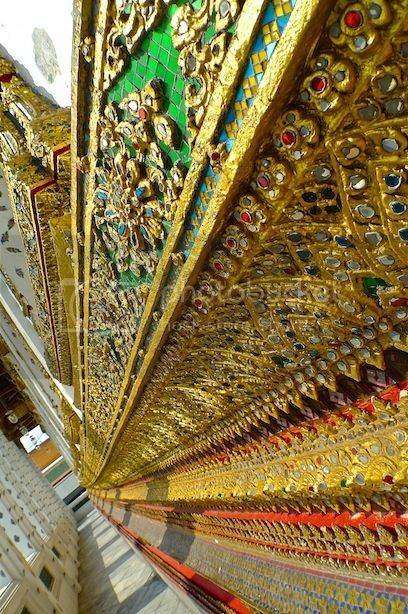 Took a close shot of the intricate gilded borders at the bottom part of the wall. Don't they look beautiful? 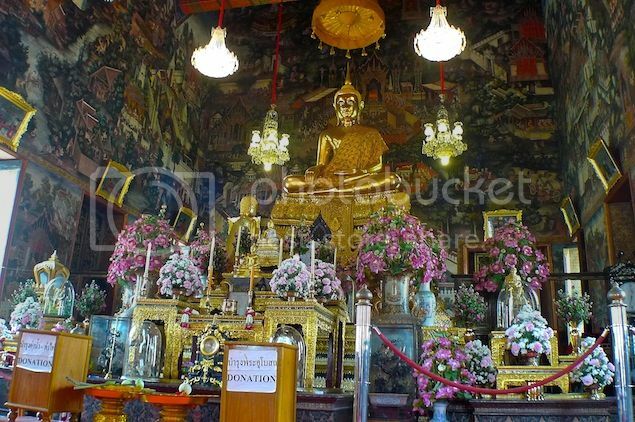 Inside the Ubosot, I saw a group of people praying with the monk sitting on a platform. 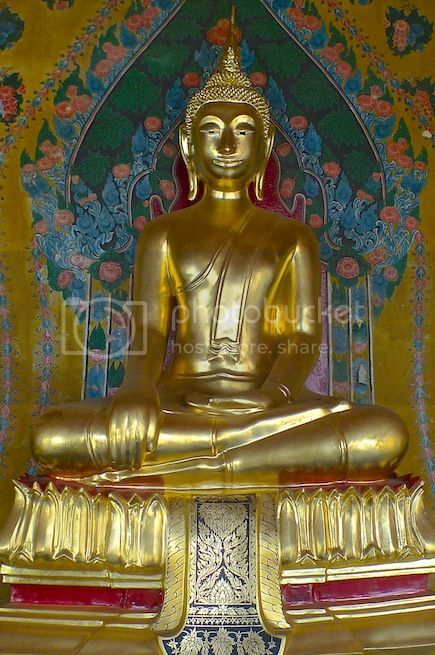 There is a big golden Buddha statue here. 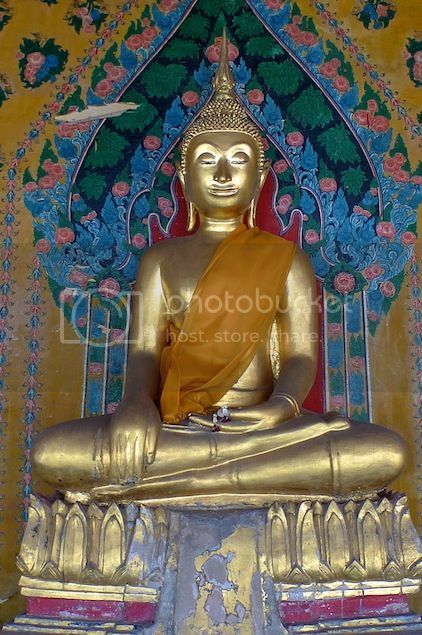 But what impressed me was the murals behind the Buddha statue. The mural paintings lined the whole wall from top to bottom. 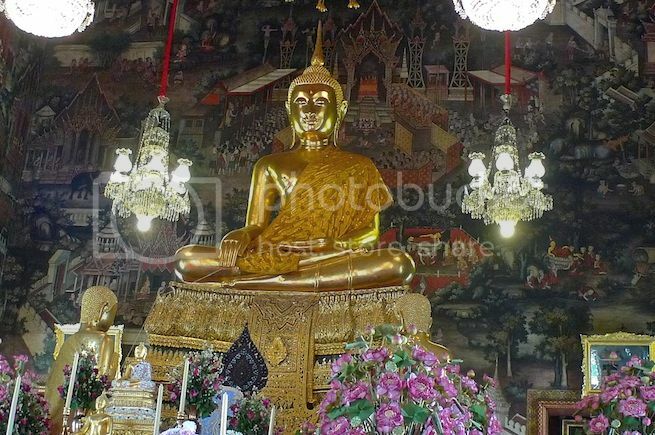 We did not venture into the Prayer Hall next to the Ubosot. 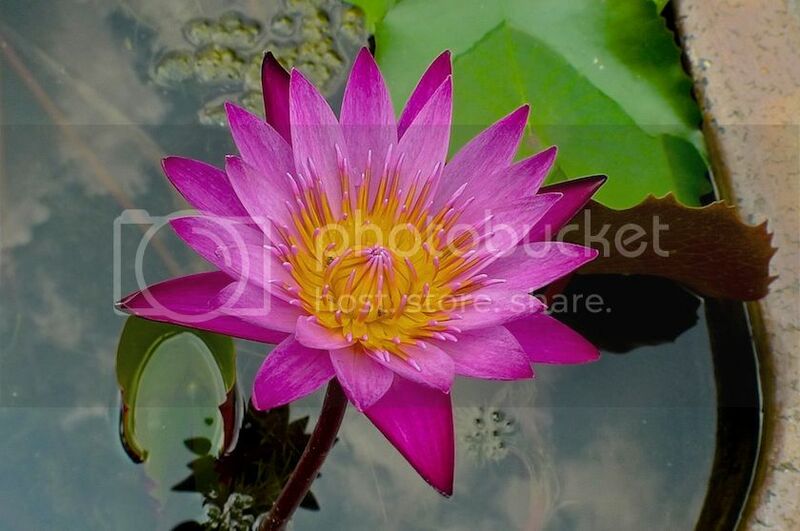 Outside the Ubosot, I saw some beautiful lotus flowers and took a shot. 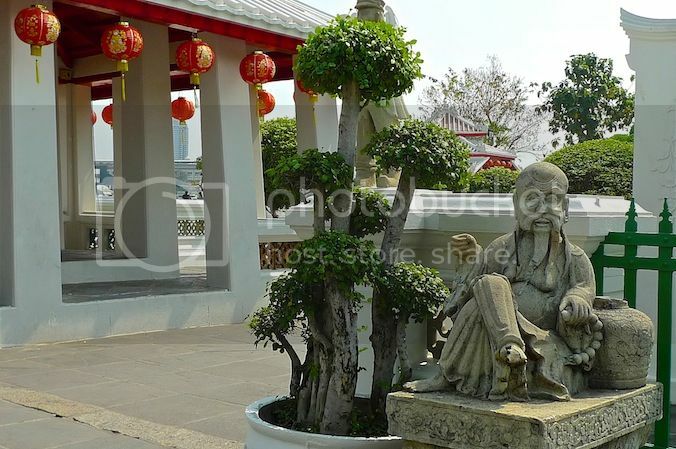 We walked around the courtyard a little bit more, snapping more photos of Buddha statues and deities. 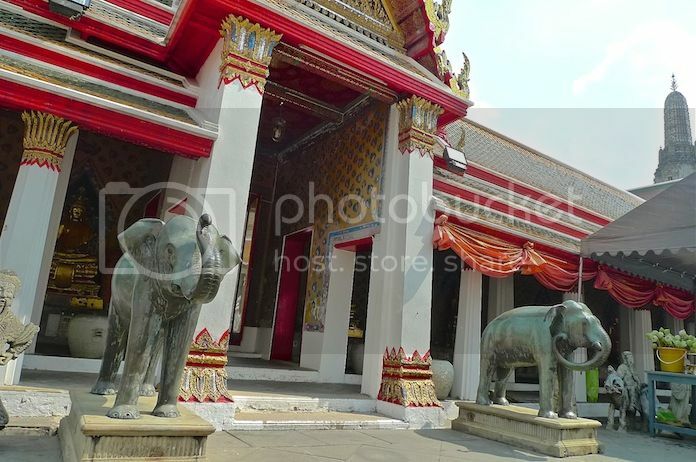 Another door entrance flanked by a pair of elephants. 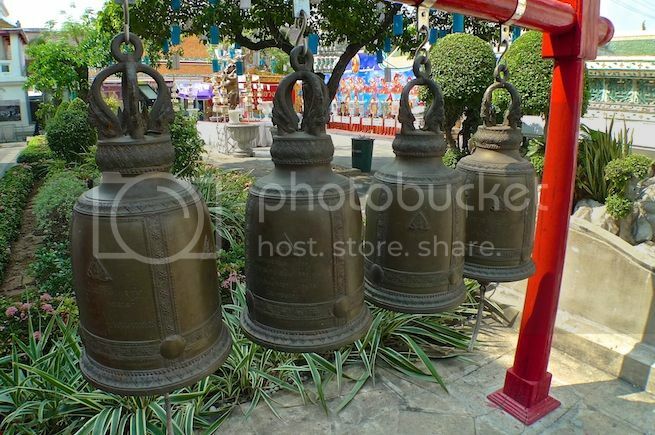 Then we came across these temple bells. 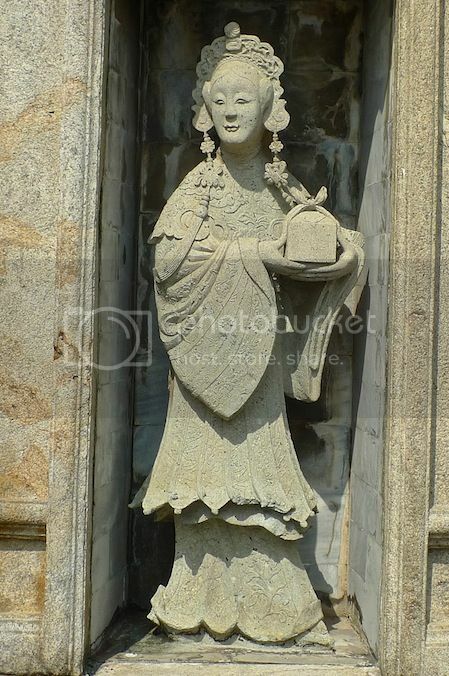 Do you know what this lady is doing? 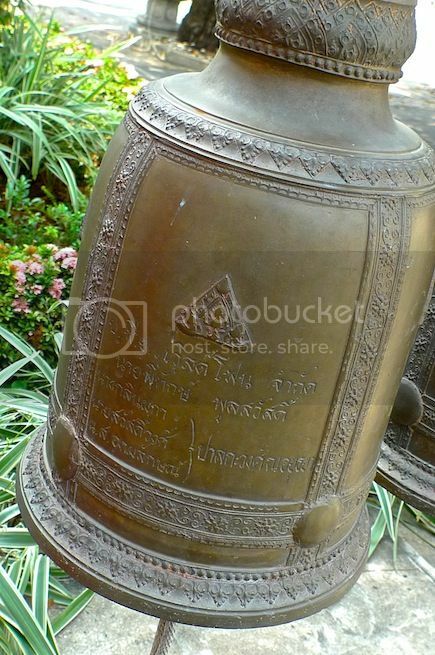 Is this for the 'Bathing the Buddha' ceremony? Anyone knows? 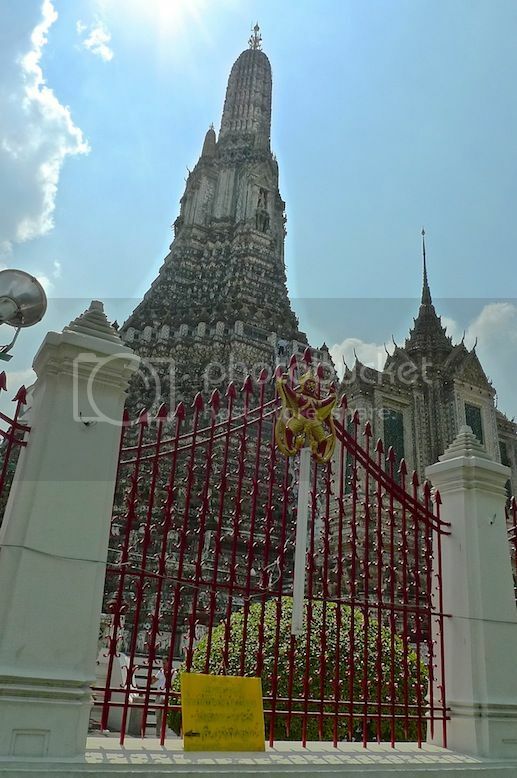 We soon reached the famous tall structure of Wat Arun called prang. It's time for some adventure, that is, to climb up that tall prang.